• PLOT SUMMARY: The Justice Society of America has John Stewart, the former Green Lantern, build their new headquarters. Sandy Hawkins gets adjusted to his newfound abilities and senses a seismic disturbance all the way in Africa. When he arrives there by riding the fault lines, he encounters a new villain called Geomancer. 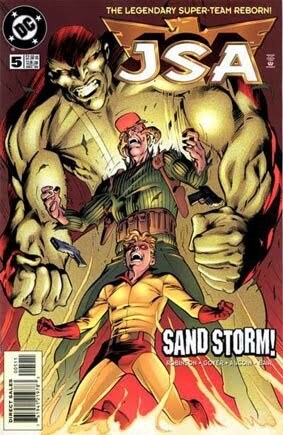 While gaining perspective as a person raised in the 1940's but living in modern times, Sand comes to terms with his past and defeats Geomancer in the process. Meanwhile, Obsidian seems to be walking on the dark side.